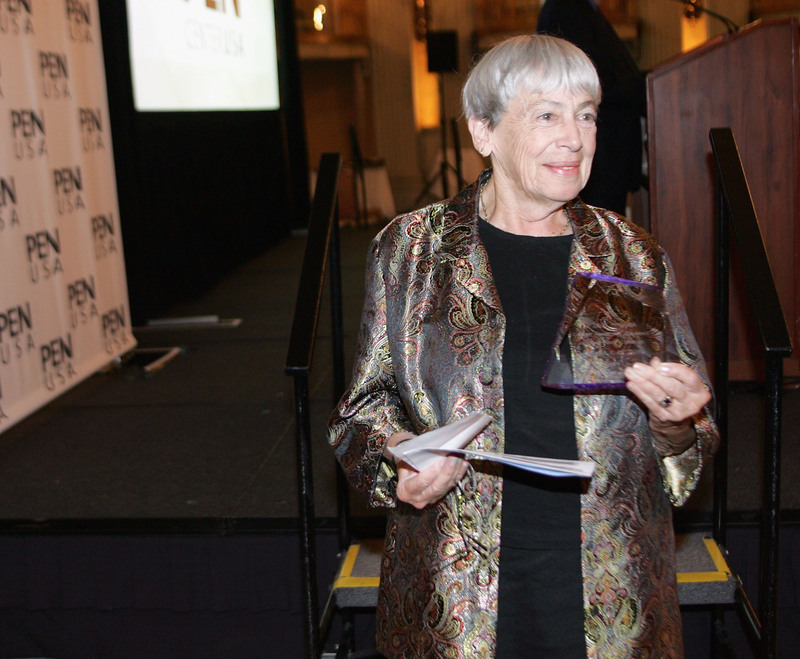 On September 9, Ursula K. Le Guin received the National Book Awards 2014 Medal for Distinguished Contribution to American Letters, which is a huge, major, unbelievably big deal. Past recipients for this award include Joan Didion, Toni Morrison, and Tom Wolfe. Le Guin’s work is garnering monumental recognition because it has stood out in terms of conventions and ingenuity. Her literary environments challenge established schools of narrative and style; her fantasy novels served as inspiration for authors like Neil Gaiman and Salman Rushdie. Le Guin’s books are tremendously multifaceted, focusing on sociological issues such as gender and race. Brilliance aside, Le Guin is one of the few female sci-fi novelists in the literary industry, and we are so beyond thrilled that her achievements are getting some real, official love. Much like Gaiman, Le Guin imbeds meaning and depth into her literature, and the stories you read are inspired by the masters: J.R.R. Tolkien, Leo Tolstoy and the feminist Virginia Woolf. Although the worlds she creates are fantastical, realism shines through as social commentary. Her books will definitely get you thinking. Le Guin, according to the National Book Foundation, has published 22 novels, 11 short story collections, 7 books of poetry, a bunch of essays, 13 children’s books, and five translation projects. And I feel proud of myself for just making my bed before I leave for work, so, yeah. This lady is rebellious. Although I did introduce her as a “sci-fi” novelist, Le Guin does not necessarily identify with this literary label. In 2012, she told Bookslut, “I would love to see somebody, somewhere, sometime, just talk about me as an American novelist.” In an interview with The Paris Review, she states, “I’m a novelist and poet. Don’t shove me into your damn pigeonhole, where I don’t fit, because I’m all over. My tentacles are coming out of the pigeonhole in all directions.” #GURL! 4. Did I mention she writes poetry, too? Her poetry encompasses a wide variety of topics including environment and everyday relationships we have with people. Her poem, “Song for a Daughter” is so simple, yet relatable and moving: “To be that heavy mother / who weighs in every thing / is to be the daughter / whose footstep is the Spring.” I don’t even like rhyme, and I’m floored. Does anyone still listen to Against Me!? No? Okay. Moving on. Le Guin’s work does explore Anarchism through books like The Dispossessed, a novel about various planets and their societies. Haven’t read it? READ it. Also, give Against Me! a listen while you're at it. While Le Guin makes you think hard, you also aren’t going to suffer from an aneurism trying to figure out what the hell is going on (I’m looking at you, Thomas Pynchon). Her books are unabashedly fun to read — and if you're dashing off to read one now, I've done my job.